If your looking for a recipe that is fun, festive and super easy to make then you have come to the right place! 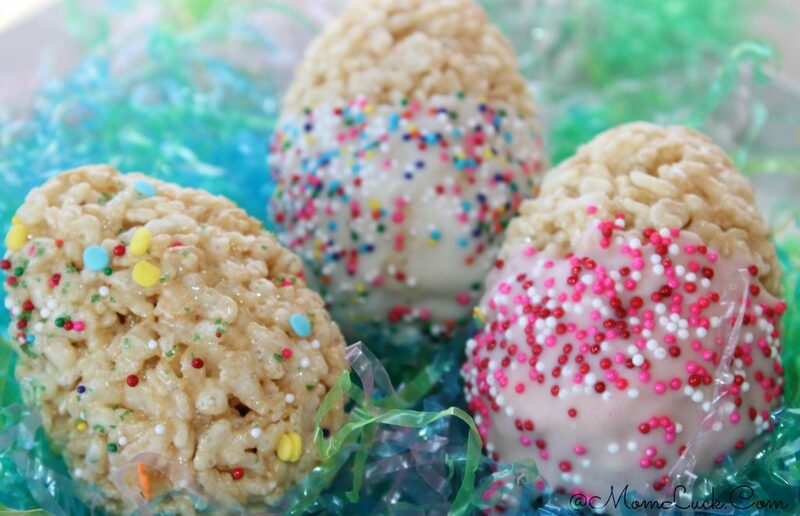 One of my families favorite treats to make and eat are Rice Krispies Treats so we’ve taken this classic recipe and made it into the perfect Easter treat. 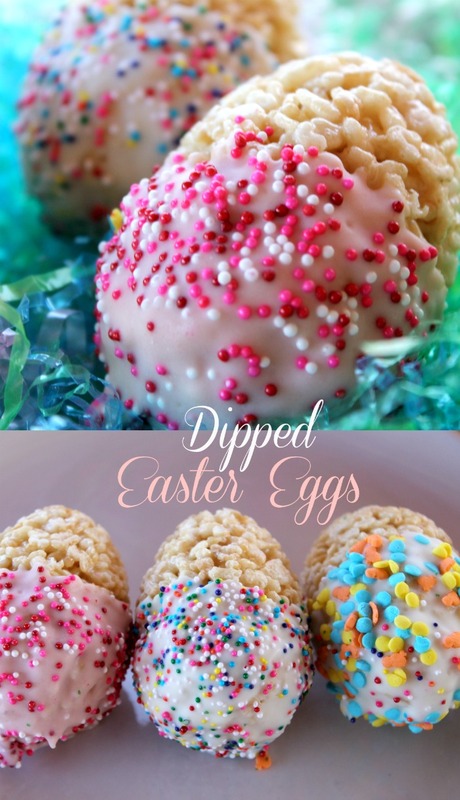 These Dipped Easter Egg treats are great to make for parties, Easter celebrations or just a special Easter snack for home. 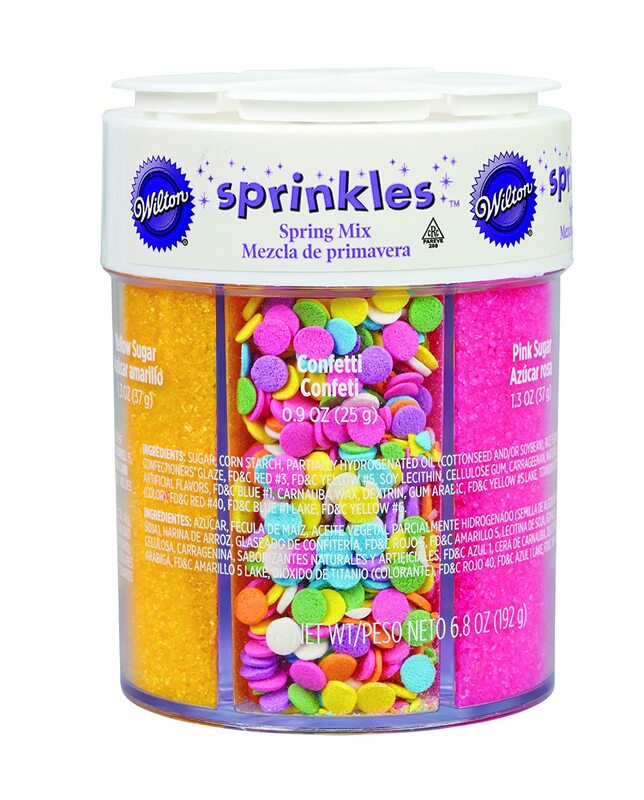 PRO TIP: Check out These UNIQUE and Hard To Find Sprinkles! 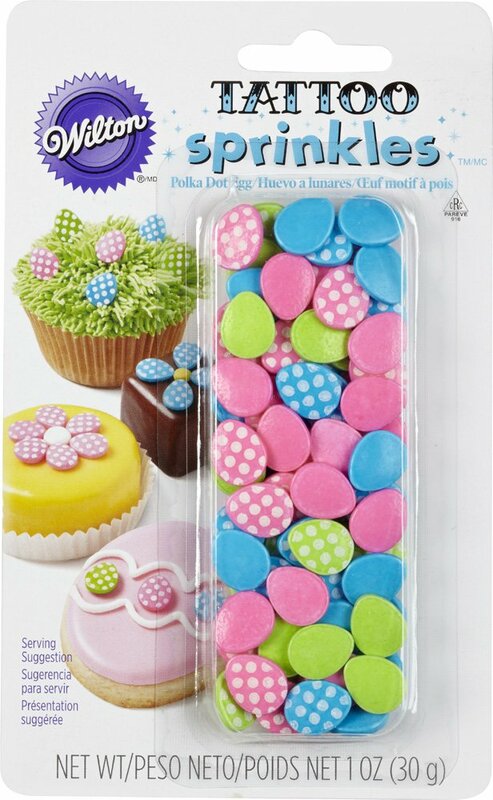 Here are a few of my favorite Sprinkles. 1. The first thing you need to do is wash the plastic easter eggs and set aside to dry. Next in a large saucepan melt the better and then add the marshmallows. Stir until smooth and remove from heat. 2. Add the Rice Krispies to the marshmallow mixture and stir well making sure you coat the cereal well and evenly. 3. Spray the inside of the clean plastic eggs with cooking spray. Now take the cereal mixture and press firmly into each side of the egg and close. Make sure you don’t over-fill or the egg will pop open and not take the right shape. 4. Let your eggs sit for a few hours or until firm. Carefully remove the eggs and set aside. 5. In the microwave heat up a few blocks of almond bark. Heat up in 15 second intervals until smooth. Next add about 1 tablespoon of Vegetable Shortening until you get the desired consistency. I used about 4 blocks of almond bark to every 1 tablespoon of shortening. 6. Take your egg and dip half of it into the melted almond bark. Add sprinkles (lot’s of sprinkles) and set aside until dry. These dipped easter egg treats are so easy to make and kids will have a blast helping out in the kitchen. The best part about this recipe is that you can add all sorts of sprinkles and other ingredients. Here are more great Easter Goodies! We made these last year but I never thought to dip them! Thats super cute and we all love rice krispie treats. I will have to remember this! Wow looks delicious! Great recipe! Easy , colorful and looks Yummy ! What do you recommend doing as the choc bark dries? Did you sit them upright? Use wax paper? I tried making these, but when we dipped them the warmth from the melted candy coating softened the marshmellow and the eggs broke apart. 🙁 Loved the time spent with grandkids doing it, but not as thrilled with the final results. Made these with my grandkids last week and posted about it on my blog: http://mysideof50.com/dipped-easter-egg-treats/ Great recipe and such fun. Linked to your post and blog on everything!